First time for me: posting something on the Blog in-flight, using GoGoInflight on US Airways within the US continental area. 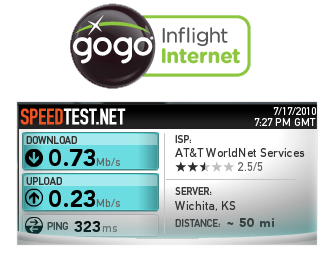 It works pretty well, showing through Speedtest 320ms ping, 3/4MBit download and 1/4 Mbit up. This is not good enough for Quake, but works well for browsing and email. I tried to get VPN working, and while the connection is there, Outlook won't connect to the corporate Exchange server. Strange, this should be a general use case. VNC works very well. Anyway, it sets me back $12, but it is worth the fun.